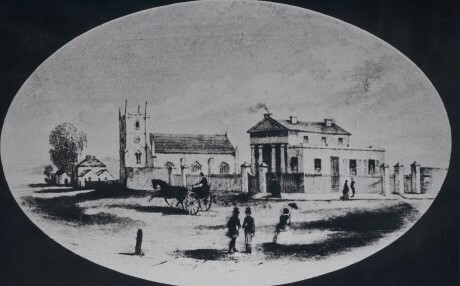 At the north-western corner of Church and Argyle Streets Hughes had a lease in 1823. The railway line is built over a portion of this land. In 1830, one, Hugh Hughes, had an inn known as "The Golden Lion”, which doubtless stood on this site, as the land was granted to the, individual mentioned. The land in Church Street, between Argyle and Aird Streets, was occupied by Charles Walker, of the "Red Cow," in 1823. It was later granted to his wife. John Eyre leased the block at the south-western corner of Church and Aird Streets, and a portion of land near the corner of Church and Campbell Streets was in the hands of John Campbell. At this period an inn known as the "Governor Bourke" appears to have stood on this property. It was advertised as for sale in the "Sydney Herald" of March 21, 1836. The property was described as being directly at the foot of the bridge, and stated that the little difficulty that prevented boats coming to the bridge would soon be removed. It was again advertised for sale on August 15, 1837. It was then described as the estate of Blackfriars, and mention was made of the effort for deepening the river, which would allow boats to reach the bridge.